As a Member of the CLLA, you are eligible for our member recruiting program. The more members you bring in, the more you save! We are offering you a 50% reduction in your upcoming renewal dues for the first new member* you bring into the League. If you bring in two new members, your membership dues will be waived for this upcoming fiscal year! When we say we appreciate your referrals, we mean it. *This will only apply to full price (attorney, agency, debt buyers, turnaround managers, law list, paralegal, and vendor) memberships. The non-member must have been out of the League for at least one fiscal year. Effective January 2016, the highly regarded bankruptcy and workout lawyer Deborah K. Ebner of the Law Office of Deborah Kanner Ebner has forged an Of Counsel relationship with the Law Office of William J. Factor, Ltd. FactorLaw, formed in 2009, continues its growth as a leading debtor/creditor and litigation boutique in the Chicago market, with nine lawyers in its Chicago and Northbrook offices. Ebner practices from her offices at 11 E. Adams Street in Chicago. CLLA President has article featured in CRF News! Be sure to check out the 4Q2015 issue of CRF News! CLLA President Robert S Bernstein, of Bernstein Burkley, P.C., has written an article featured in the publication. “The Ten Most Important Things That the Collection Professional Absolutely Needs to Know About Bankruptcy” was co-authored by Allison L. Carr, also of Bernstein-Burkley P.C. CRF Report – CLLA Attends CRF Seattle with Great Success! The Commercial Law League of America (CLLA) recently participated in the Credit Research Foundation’s (CRF) Forum & Expo in Seattle, which was reportedly the largest attended CRF Forum to date. The CLLA was represented in the booth by Tim Grimes, the Legal Director with Andersen, Randall & Richards. Mr. Grimes said that many credit professionals stopped by the booth to learn about the CLLA and talk about the services that its members provide. Mr. Grimes discussed the purpose of the CLLA with attendees and explained the benefits of using a collection agency certified through the CLLA certification program, which also is endorsed by the International Association of Commercial Collectors (IACC). Mr. Grimes also explained the CLLA-IACC alliance to CRF members and encouraged them to visit the IACC booth, where the IACC representative also shared the benefits of using a CLLA-IACC Certified Commercial Collection Agency. Thank you to Mr. Grimes for ensuring that the CLLA’s message about the benefits of using CLLA-IACC certified agencies was shared with a wide audience. Congratulations to the CRF for another successful event! 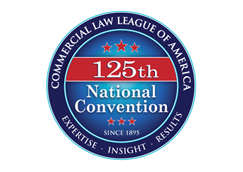 During the Commercial Law League of America’s Annual Convention, April 29 through May 2, 2015, the membership voted to approve nine constitutional amendments. Approval of the amendments was a culmination of the Constitutional Amendment Committee’s study of the League’s Constitution where its charge was to update the Constitution to align with the CLLA’s current structure and goals. The Committee’s recommendations were discussed and ultimately approved by the Board of Governors. Prior to the Convention, the Board approved amendments were submitted to the entire CLLA membership for review. An explanation and vibrant discussion of the amendments was conducted at the opening business session in Las Vegas. While many of the changes were technical in nature, there were several substantive modifications to the Constitution. Among the substantive changes were: merger of the New England District into the Eastern District; a broadening of membership eligibility; a reduction in the number of members of the Board of Governors; and elimination of restrictions imposed on lay members. Due to its geographic makeup, the New England District has naturally and historically comprised of the lowest regional membership. In a logical move, the membership approved a merger of the New England District into the Eastern District. The move eliminates additional costs and structural formalities of the sparsely populated district. As the CLLA focuses its efforts on reaching out to a broader base of the credit and commercial business communities, it was important to open its membership to include individuals who were previously not eligible in the past. Such individuals include credit managers, business executives, and other trade professionals. The underlining theory is to eliminate any barriers imposed on someone who finds value in the CLLA and wants to take advantage of being a member. There is not an expectation that this change will result in an immediate opening of the flood gates to new members, but will allow the CLLA flexibility in reaching out to untapped areas with the ability to offer the benefits of the League. An important aspect of the CLLA’s strategic plan is to restructure the Board of Governors to a more manageable size and composition. A large step towards that goal was achieved through these amendments. The size of the Board was reduced from 17 members to 13. The transition from 17 to 13 members will occur over the next three years by electing only one attorney board members (rather than two) starting in 2016. Prior to the amendments, two attorney board members were elected each year. There are currently six attorney board members. With the election of only one attorney board member next year, the Board will then have five attorney members. By virtue of the dissolution of the CCAA, that section’s representative was also eliminated; however, an at-large agency member position will remain. By 2018, the Board will consist of 13 members which will include the President, Immediate Past President, President-Elect, Recording Secretary, Treasurer, three Attorney Board Members, one representative each from the Bankruptcy, Young Members and Creditor Rights sections, a Law List representative and an Agency Representative. Perhaps the most significant change was repealing Article XXI of the Constitution which restricted lay members of the CLLA from publicizing that they are members of the League. More specifically, the Article provided that any non-attorney member of the League shall not “use, authorize or permit the use of the designation ‘Member of the Commercial Law League of America’ or other words, initials or symbols indicating such membership, in connection with or upon any stationery, business card, or public relations, advertising or other similar materials”. Certified agencies, however, were permitted to advertise their membership in the League’s CCAA. This restriction applied to all non-certified agencies, law list members, accountants and other members of the League. Certainly, the premise of any organization is to encourage its members to positively promote the organization and convey to the public that they are proud members of that organization. Article XXI inhibited that ideal. The CLLA leadership is cognizant of the potential abuses that may result from the repeal of Article XXI, and believes that it currently has in place effective procedures to deal with anyone who unethically misuses their membership or non-membership in the CLLA. The League has consistently and will continue to admonish and pursue both members and non-members who misuse CLLA logos and other intellectual property and falsely publish their membership in the League. In an effort to ensure the effectiveness in the CLLA’s enforcement policies, President Bernstein has appointed a committee to study and, if necessary, propose additional policy and provisions imposing appropriate sanctions against those who inappropriately use the CLLA’s intellectual property and misuse their membership in the League. Kirk Burkley Comments in Law360 Article on Behalf of Creditors? On April 23, 2015, Wanda Borges was presented with a Woman of Distinction Award by St. Catharine Academy, her alma mater, celebrating its 125th Anniversary. The purpose of the Saint Catharine Academy Woman of Distinction Award is to honor SCA alumnae who “make or made a difference.” This tribute recognizes alumnae for their significant achievements, service and contributions to their careers, community, nation or society as a whole. Wanda Borges, Esq., class of 1968 is a commercial creditors’ rights litigator and bankruptcy attorney. She is the principal member of Borges & Associates, LLC. She was a trailblazer early in her career, foregoing law school and, instead, reading the law to pass the New York State bar exam. Wanda is past president of the Commercial Law League of America and is a nationally recognized lecturer and author on various legal topics, including the enforcement of judgments, bankruptcy, antitrust, and the Uniform Commercial Code. She has been included on the New York Super Lawyers-Metro Edition List each year since 2009. Wanda is a former Chair of the Mercy College Board of Trustees. CLLA Member in the News! CLLA Member, Steve Kailas and his firm, Kophner, Mann, & Kailas are in the news as they help to bring justice to Wisconsin Businesses – and millions back to the Wisconsin economy. To read the JSOnline Article, click here.